The juvenile was later released into the custody of his mother. Additional information, when available, will be posted here. OCCURRED: October 17, 2012 1:45 p.m.
REPORTED: October 17, 2012 1:52 p.m. This afternoon a female student reported to University Police that while she was walking through lot 1D, a young male approached her on a bicycle and asked to borrow her cell phone. The student did not hand over the phone and the young male then grabbed the phone and rode off on his bicycle toward Presidential Drive. The student attempted to stop the male by grabbing his shirt but then let him go after a brief struggle. The male dropped his bicycle at the intersection of Campus Drive and Presidential Drive then ran toward Adelphi Road and Tulane Drive. He was last seen running between buildings on Tulane Drive toward Stanford Drive. The student was not injured. No weapons were used in the commission of this crime. The University of Maryland Department of Public Safety is conducting an investigation of this crime. Individuals with any information regarding this incident are encouraged to contact police (911 or 301-405-3555). You may also email any information to investigations@umpd.umd.edu. The Prince George's County Police District 1 Robbery Suppression Team has made an arrest in these cases. Investigators have arrested and charged a juvenile male for the offense. A black bb gun was recovered along with the victim's cell phone. For further information, please view http://pgpolice.blogspot.com/2012/10/pgpd-arrests-suspect-in-college-park.html. An attempted armed robbery, also occuring to the rear of the University View, was reported to PGPD. This occurred at approximately 10:30 p.m., just prior to the below incident. PGPD is investigating. On October 10, 2012, the University of Maryland Police Department was notified of an incident that that occurred near the UM campus. The Prince George’s County Police responded to investigate. Below is a brief synopsis of the incident. The Prince George’s County Police responded this evening for an armed robbery that had occurred off campus at approximately 10:30 p.m. behind the View apartment complex. The female student victim reported that she was walking toward the View when she was approached by a male who displayed a handgun and demanded her property. The male then fled from the area, away from campus. The Prince George's County Police Department is conducting an investigation. Individuals with any information regarding this incident or the possible identity of suspects are encouraged to contact police (911 or 301-772-4908). Additional information, when made available by the Prince George’s County Police, may be found at http://pgpolice.blogspot.com/ or on our website at http://www.umdps.umd.edu/crime_alert.cfm. College Park, MD – On October 3, 2012 University of Maryland Police investigators applied for and received criminal charges against Michael Charles Manley Jr., 25, of Gambrills, Maryland for his involvement in a theft at the University of Maryland book store in the Adele H. Stamp Student Union on September 12 and September 17, 2012. Manley is charged with theft: $1,000 to under $10,000 and theft: less than $1000. Manley stole and attempted to steal multiple textbooks from the University Book Store. From September 29th to September 30th, The University of Maryland Police Department was out in force to help raise money in support of the Special Olympics as Dunkin Donuts opened its doors at 5 am. Just 31 hours later, we reached our goal of $6,000.00 and exceeded it by raising a total of $6,471.11! This could not have been possible without the generous donations of the College Park community stopping by at Dunkin Donuts at 9710 Baltimore Avenue this past weekend. For the second year in a row, we had a team of people that helped raise awareness; from officers on the roof and near the intersection of Route One to other UMDPS team members and Special Olympics partners raising awareness and interacting with customers as they entered the store. We accepted donations, sold raffle tickets, shirts, hats, and more. Five officers took turns perched upon the rooftop of the Dunkin Donuts - keeping a Cop on Rooftop for 31 hours! These officers are Sgt. J. Brown, MPO Mable, PFC Powers, PFC Meekins, and Pvt. Dykstra. Also, congratulations are in order for Sgt. J. Brown, for defending his title and becoming the two-time donut eating champion! Sgt. J. Brown was the first to eat four whole donuts in three minutes. A special thanks to the proprietor and staff of the College Park Dunkin Donuts for giving us the space and for donating donuts and coffee (everyone who donated was offered a free coffee). Without you this event would not have been possible. Finally, a big thanks to the event organizers, Sgt. P. Miller and A/Sgt. R. Hoaas who made all of this possible. Without your time, effort, dedication, and energy, we wouldn’t be where we are at today. College Park, MD - Police Officers from the University of Maryland Department of Public Safety will collect donations for Special Olympics Maryland on the rooftop of the College Park Dunkin’ Donuts the weekend of Sept. 29th - 30th, 2012. Anyone who ever thought nothing good could come from cops sitting around (or in this case ON) a donut shop might reconsider that notion when “Cops on Rooftops” – a fundraiser for Special Olympics Maryland -- comes to the College Park Dunkin’ Donuts location on Saturday, September 29th through Sunday, September 30th, 2012. As part of a national fundraising effort for Special Olympics Maryland, five good-natured officers from the University of Maryland Police Department – Officers Brown, Dykstra, Mable, Powers and Meekins have volunteered to spend the day on the roof of Dunkin’ Donuts restaurant at 9701 Baltimore Avenue, College Park, MD. Their collective fundraising goal is $6,000.00. In 2009, the first year a Maryland location participated in the promotion, the Laurel Dunkin’ Donuts and Laurel Police Department raised more than $7,000. In 2010, five Dunkin Donut locations partnering with law enforcement raising $30,000 for Special Olympics Maryland. In 2011, eight Dunkin’ Donuts locations across the state took part in the program: Laurel, College Park, Westminster, Towson, Reisterstown, Havre de Grace, Mount Rainier and California. Dunkin’ Donuts customers and the general public alike are encouraged to stop by and support the officers in their efforts to raise both funds and awareness for the Law Enforcement Torch Run® for Special Olympics Maryland. Along with law enforcement volunteers who will be on the rooftop, other officers will greet customers inside and outside of the store, passing around donation jars and rallying support for the cause. There will also be a silent auction as well as a raffle for items. A merchandise table will also be set up, with Torch Run t-shirts for sale as well as raffle tickets for a 2011 Harley-Davidson XL1200 Nightster donated by Rommel of Annapolis Harley Davidson. “Cops and donuts have a long, humorous history together, so it was only fitting that we team up with the great folks at Dunkin’ Donuts for this light-hearted event,” said David B. Mitchell, Chief of Police of the University of Maryland Police Department. “This event allows us to do something great for an incredible organization and poke a little fun at ourselves at the same time. What could be better than that?” The event was founded on the idea by the law enforcement officers of Illinois, who in 2009, took to the rooftops of 94 Dunkin’ Donuts locations across the state and raised more than $182,000. SOMD is a year-round sports organization dedicated to providing quality sports training and competition opportunities to Maryland’s children and adults with intellectual disabilities and/or closely related development disabilities. SOMD currently serves 10,000 athletes statewide, and offers 28 sports, all at no cost to the athletes or their families. For more information about SOMD visit www.somd.org or call 410-789-6677. COLLEGE PARK, Maryland - The University of Maryland Department of Public Safety announces the publication of the 2012 Annual Security Report. The Annual Security Report provides safety and security information to current and prospective University of Maryland students as well as to faculty and staff members. Statistics comparing crime over the previous three years are outlined in the report. "This is an excellent way by which we are able to highlight the security resources available to the University community,” said David Mitchell, University Police Chief. "I urge the University community to read the report and be aware of, and more importantly, take advantage of security services on campus,” Mitchell added. In addition to outlining the different security resources the campus has to offer, the report also provides statistics on area crime reported to on- and off-campus law enforcement agencies as well as to several University departments which report data back to the Department of Public Safety. All of these incidents include data from the local area surrounding the UMD College Park campus, and also includes reports made to non-law enforcement entities. The Clery Act does not require the reporting of statistics for the crime of theft, which is, by far, the most commonly reported criminal offense on campus. UMD saw a decrease in reports of theft on campus dropping about 11% from 2010 to 2011 (199 in 2011 compared with 225 reported in 2010). Other property crimes reportable through Clery include Burglary, Motor Vehicle Theft and Arson; all of which showed reductions from 2010 to 2011. 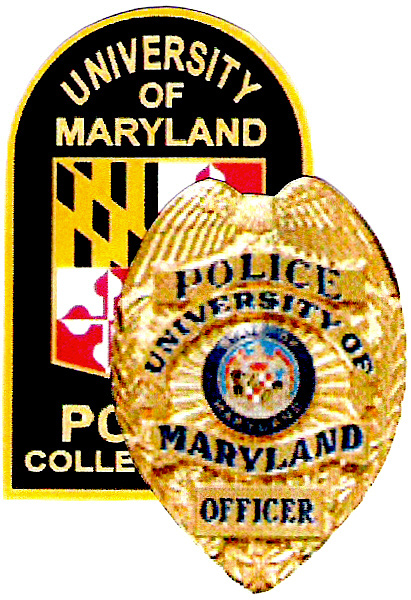 The University of Maryland Department of Public Safety (UMDPS) is the primary law enforcement agency responsible for policing the University of Maryland College Park campus. Programs and resources provided by UMDPS include walking escorts; closed circuit video monitoring; patrols by uniformed officers; explosive detection K9 unit; emergency alerts; crime prevention programs; criminal and traffic law enforcement, reporting and investigation; Student Police Auxiliary; and an Emergency 911 center. These programs are highlighted within the Annual Security Report. Other campus safety and security resources include services provided by many other University departments such as the Department of Resident Life, Residential Facilities, Environmental Safety, Transportation Services (Shuttle-UM), Health Center, Office of Student Conduct, and Counseling Center to name a few. The Annual Security Report goes into further detail about the programs and services of these departments. “Reviewing the information outlined in this brochure will increase your awareness, and awareness is the precursor to action” stated Mitchell. As a result of this Drug Take-Back event, UMDPS collected 18 pounds of pharmaceuticals from community members. College Park, MD - The University of Maryland Police will be hosting a site for the Drug Enforcement Administration’s National Prescription Drug Take-Back Day which will take place on Saturday, September 29, 2012, from 10:00 a.m. to 2:00 p.m. The site will be located at the front of the University of Maryland police station located on Rossborough Lane across from Ritchie Coliseum. This is a great opportunity for those who missed the previous events, or who have subsequently accumulated unwanted, unused prescription drugs, to safely dispose of those medications. All community members are welcome to drop off unwanted, unused prescription medication. Americans that participated in the DEA’s fourth National Prescription Drug Take-Back Day this past April turned in a record-breaking 552,161 pounds (276 tons) of unwanted or expired medications for safe and proper disposal at the 5,659 take-back sites that were available in all 50 states and U.S. territories. When the results of the four prior Take-Back Days are combined, the DEA, and its state, local, and tribal law-enforcement and community partners have removed 1.5 million pounds (774 tons) of medication from circulation. In Maryland, we had 49 agencies collect over 8,116 pounds at 104 take back sites. For more information on the initiative and for details on what may be turned in, view the DEA Take-Back Initiative website at: http://www.deadiversion.usdoj.gov/drug_disposal/takeback/index.html. WHEN: September 24, 2012 at 10:45 a.m.
All members of the media are invited to attend. College Park, MD – The University of Maryland Police Department is proud to announce the inception of its Explosive Detection K9 program. Four UMPD handler-K9 pairs have completed a rigorous four month training course and are graduating Friday, August 10th. 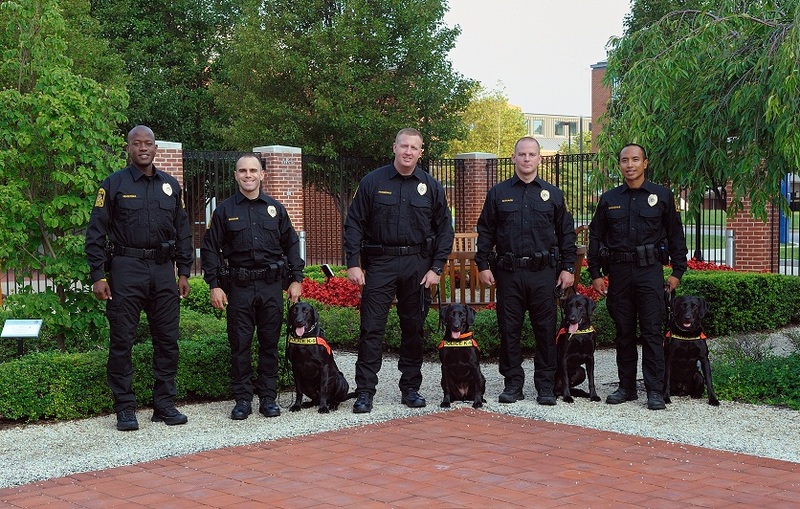 The K9-handler teams are trained exclusively for explosive detection purposes and will be deployed on and around the UMD College Park campus and will also serve a critical function at special events such as athletic events, dignitary visits, and any event likely to draw large numbers of attendees. UMPD is the first university police department to employ canines which can detect and track person-borne explosive substances. “UMPD is committed to the safety of all students, faculty, staff and visitors to our University. The addition of our K-9 program enhances our ability to locate and isolate potential hazards or threats toward the University community” – David B. Mitchell, Chief of Police.